I just got back from a very interseting shooting session. I went out with Ed Verdugo from GRSC to test a prototype 1-4x illuminated combat scope he is testing that features his patented General Purpose Reticle. This variant is calibrated for 62 gr. bullets from a 1/7 M4 14.5" barrel. I just happen to have a really good Noveske Afghan barreled Colt. We went to West End gun club in SoCal and were fighting winds that went from steady 20 mph, to gusts to over 60 mph..............great range day , and thank God for steel targets. We zero'd the rifle (with both the GRSC scope and my TA55........thanks to Mark LaRue for making optics swaps totally easy and accurate) and went to work. The 100-200 yard stuff was disgustingly easy with the center dot of the "Horseshoe" reticle. Even with the wind, we were easily able to make rapid hits. We had a few shooters ranging from Ed and I with extensive shooting experience to a young man who had never fired a rifle in his life. The rookie (with strong young eyes and good health) was hitting steel silhouettes at an alarming rate. THe scope makes this stuff easy once he was shown how to range and use the reticle. We went to the long range and were hitting easily at 300 yards with the 300 yard dot....dead on. The 400 yard target was down, and it was almost imposible to get really good spotting on it, so we moved to a humanoid size steel target at a lasered 532 yards with Winchester 62 gr. police training ammo. We all got some hits using the 5-600 yard dots and the horizontal lines that equate to 10" spacing in that are of the scope for windage correction for the horrendous 30-60+ mph winds we were getting flowing out of two seperate canyons...................this was very tough shooting conditions. We were concerned about having to use a 550-600 yard dot to get on with elevation, so we switched to Canadian SS109 NATO ammo........whole new ball game. This was definately hotter and was hitting dead on-a hair low with the 500 yard dot, and a hair high with the 550. Once we got the wind figured out, the novice shooter got three back to back hits at dusk at a measured 532 yards on a 30" wide target in horrendous conditions just by using the reticle, and never touching a turret on a 4x scope. This is pretty impresive. When we switched the illumination on when it got dark, it was a little too bright for my taste, but that is a compromise to get the daytime brightness up to a usable level. This reticle design is the absolute hot ticket. 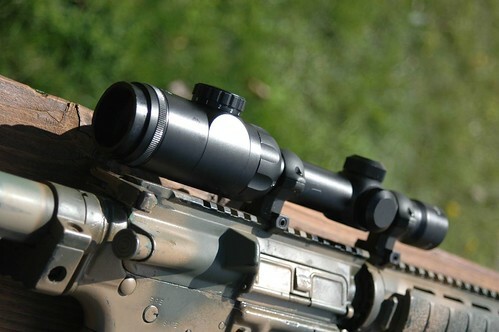 Ed is working on prototype scopes at a nuts price-point (soldier usable and affordable). Hopefully, the scope will weather some tough testing as far as ruggedness. 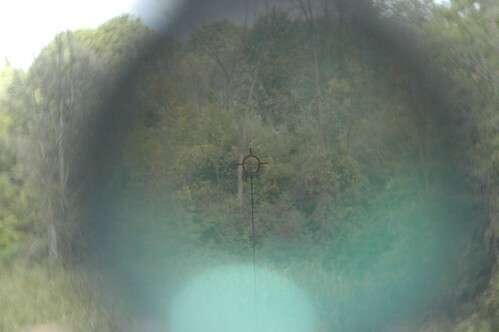 My dream is to have Mark LaRue start building scopes with this reticle............my world would be perfect. I have encouraged Ed to start posting here as I believe the experience and technical expertise of the folks here is on a higher level than other places he has been, and can provide a good arena to share what he is doing. "Cpl ##### is condescending and abrassive towards coworks who don't follow directions" my favorite evaluation quote........if I'm like that at work, you should see me on the internet . "Even if I order you to trim your mustache, you're going to totally ignore me, huh".-another favorite supervisor "discussion". i wonder if that's the same scope ed showed me more than a year ago (i think USO might have made that prototype). if i recall correctly, the IOR CQB scope reticle is loosely based off ed's GPCR horseshoe. i hope ed's closer to getting it to market. Is that the Mueller 1-4x scope that was discussed for a long time over at the other site? If it is how is it holding up and is illuminated reticle visible in bright day light? and a one peice tube and a staright 20 mm not the flared 25 mm objective seen there! Sure looks like the Meuller to me. A "guy" on TOS, supposedly from Meuller, stated that the above reticle had been shitcanned, and the scope will go into production with a German #4 I believe. Who the hell knows what will happen with the Meuller, my faith has been lost considering how long that thread has gone on and based on responses from the Meuller rep. I hope the GRSC offering can come to market at the right price point for the average grunt, while retaining ruggedness and dependability. Time will tell.....or not. The GRSC reticle is not the same as the one above. I have been watching the progression of Ed's search for the perfect optic and reticle combination for the last 17 years. I am convinced that his currently patented reticle is the way to go. THe issue now is the hardware to house it. In regards to militarymoron (hey pal ), it is similar to the original USO version, but I think this new one actually done specifically for the M4 with GI issue ammunition is better. I only hope the hardware holds up. So far, the glass is excellent for its price point, and I am highly impressed with the prototype. Again, I think the reticle is right on the money, only time will tell on the rest. Yes, after I looked back at the thread I noticed that you had MI in common, and your typing "style" is unique.